A CONNECTED ROOM OF ONE'S OWN. 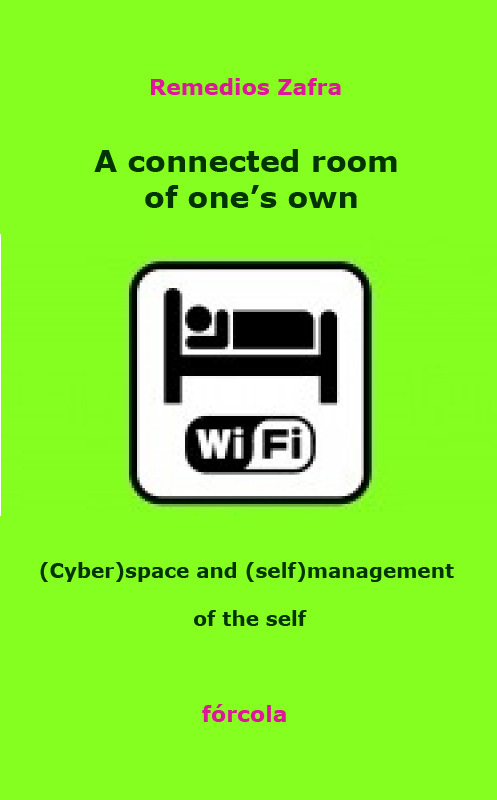 A Connected Room of One’s Own is an insightful essay about intimacy, about the spaces of privacy and the Internet; a book which sets out to ponder the challenges new online habits and customs pose to creativity, politics, and the management of our personal identities. It brings a broad range of disciplines to the discussion –from anthropology and sociology to philosophy and politics– certain to be of interest to researchers working in the fields of online culture, feminism and identity/cultural studies. keywords: Remedios Zafra, Virginia Woolf, a room of one’s own, Internet, feminism, private spaces of privacy, public space, essay, anthropology, sociology, subjectivity, identity, intimacy, Google, web 2.0, email, politics, addiction, cyberpunk, digital culture, art, poetry. Remedios Zafra is Professor of Art and Innovation at the University of Seville. She has a PhD in Fine Arts and degrees in Art, Philosophy and Anthropology. She is author of numerous essays about feminism, identity and digital culture. The Net has split my life into 300 tasks, of which 98 have to do with writing and using a keyboard; 35 relate to search, search! ; 6 to updating software; 51 to saving files; 67 to minimizing-maximizing; 18 to discovering my body (oh, goodness, my body! ); 34 to waiting for “that” email to arrive; 19 to drifting online, 45 to contacting you;you; you; 36: “do it yourself” (myself); 21 to “they can’t see me”; 9 to “tomorrow is another day”. The Net does not deny other miscellaneous tasks to be carried out in the privacy of a room of my own. The sum of them does not tally with the expected amount of splits because new tasks and classifications emerge constantly. Believe me, I realize you are only doing your job and that the categories, forms and computer programs you use are prearranged, that they make it easier for you, and they aim “to make it easier for us” to understand things. I realize those tools are designed to ascribe this text to the “essay” section of the “book” category, see: subjects “books about building rooms for thinking”, “books about rooms with windows”, “books about daily life on the Net”, “books for swatting flies”; see also any other established archival heading you have been handed down and wish to use, trying to overlook the fact that these began life as conjectural and random. I apologize for making things difficult, but I need to warn you just in case you were expecting this to be an in-depth subject study or a single discipline study that either proclaims its truth or registers its amazement from a one-way, rooted viewpoint. And if it were rooted (we can accept the possibility), it would be as it was for Woolf: I am rooted, but I flow. Consequently, do not waste your time on this book if you intend to fill a bookshelf of your mind tattooed with a heading of established wisdom. This is not a book that revisits what the extant bookshelves of the world already know or corroborate. To those of you who ask yourselves what viewpoint does the writer speak from, what arrangement of things does the writer appraise and tackle on which to rest the authority of her words and, on its corresponding bookshop’s ledge her way to arrange them, I say that you will not find herein a treatise about Philosophy, Art, Computers, Anthropology, Activism or Literature, or an essay about erecting walls or aluminium shutters for the windows in a room of one’s own. And although an analysis of contemporary culture, Internet, the political theories about the individual, the economics of private spaces, the construction of identity and the critical observation of the spaces of intimacy are contained in the writing that follows, they are like a liquid that is not impervious to interplay and mixture. Indeed, it would even like to risk changing categories from a resigned and grumbling title to one of imagination, space and potential. You should know that you are not obliged to read this book. Without vanity, it does not hide the fact it navigates through the blends of daily life, where specialists able to understand and accept the most complicated scientific images turn stupid, in the dismantling sphere of a momentary collision with the incapacity of living . You will find that the conclusions herein do not set out to lay the foundations for a new online revolutionary, post-capitalist movement with cells in each of those rooms of your own. We do, however, welcome any radical plans that may be inferred, any significative re-location undertaken so as to begin the task of re-semanticizing the critical practice and subjectivity of our on-screen lives. A rejection of linearity and disciplinarity from a non-unitary perspective of discourse, does not necessarily lead to a kind of cognitive relativism, but rather, to a network of vanishing point lines in the manner of a theoretical project that does not discard the creativity of contradiction and doubt; lines that may join the conversation with questions of their own, which have yet to be cracked by an accepted order of things, as they do not wish to reiterate that which has been said before. Unafraid, they seek to disorder to make us think differently. These possibilities of reception, if they actually manage to be built during the act of reading, do not shoot from a blue, monochrome, clean, transcendental, tidy, specious prism or from an ambitious question of zeitgeist. Their origin is more modest and untidy, more liminal, yet more authentic too perhaps. I am referring to a connected self which spends more and more time in a room of its own; a self which refuses to yield its willpower to the mediated and rapid symbolic excess of its everyday world –as though its willpower were something tired and useless, a little finger, an ornate fingernail. I am referring to a self that is disappointed by the lack of imagination in the ideation of new on-screen critical figurations , a self which questions itself about the present state of the subjective construction with careful deliberation. A deliberation not divorced from the sensations on our bodies and spaces which, often ineffably, accompany the things that upset and hurt us in our online lives, the things that fight against being fully exposed, which desirous of being perceived by so many of the age’s hurried reasons, bear up dignified and pock-marked with holes at our side, without showing themselves fully. Accordingly, I will speak from the legitimacy of the self which, despite being intertwined in identities of the age, knows itself (would like itself) to be agent of its words, even when its words are a quote, appropriation or parody of others. I would like in this way to communicate with the world through my own world, conscious of possible prejudice, defending one’s own experience, reading and motivation as any another argument of authority would do, ordering things from viewpoints that are as random as they are solid, in an attempt to reach them by means of a critical approach, but also thanks to the unconcealed empathy and bias of subjectivity, which act as an assurance of authenticity as opposed to an impediment. Consequently, I should tell you that I exist. I’m not a computer application that writes books, nor am I the marketing product of a popular and powerful publisher. I am not a wiki-style avatar operated by a number of individuals, nor a fiction masking a textual experiment. I should tell you that I have a body, desires, doubts, manias and questions. I should warn you that I write about the present through the body and “not fleeing from it” . And from this position of embodied materialism I am aware of my own cultural and geopolitical location in Southern Europe, oscillating between the rural and the urban world, and in a time balanced between the end of a century which never completely dies and the beginning of a new one, a non-static position, which changes as I write. On or about December 1910, human character changed […] The change was not sudden and definite […) But a change there was, nevertheless; and, since one must be arbitrary, let us date it about the year 1910 […] All human relations have shifted –those between masters and servants, husbands and wives, parents and children. And when human relations change there is at the same time a change in religion, conduct, politics and literature. Let us agree to place one of these changes about the year 1910 […]. We could, with regard to our case, state (with a pretence of epicness if you like) that it was in December, or in September perhaps –well we only really know that it was in the first years of the first decade after the year 2000– when the Internet became normalized in the globalized world, or better, when the Internet irreversibly globalized the world by connecting us. It did not take long for us to take it for granted, for it to become an indispensible part of our daily lives. One fine day we found we had become riveted to our computer keyboards to be and to live in the world. We may, if you like, try to visualize the period by walking back in time, shifting ourselves into the last century, like one of Benjamin’s angels, inspiring thus our grief for something that dies and which heralds the birth of an era of networks. However, I should stress this would be an incomplete and incorrect symbol because the change happened quietly, devoid of any explicit signs of war and without any ruins that could not be archived and subsumed by the Net itself. Neither do we have sufficient pictures that witness, albeit synthetically, the process of change the Net performed on all of us. For once, history was being made by each and every one of its actors, by each and every person connected to the Internet. The crux of the matter happened because the Net took over the screen –window, mirror, blackboard and panoptical– and it was portable, and it made it possible for us to be producers of digitalized things and ideas which could be shared and built with other connected individuals from our own homes or from any other online space. In addition to this, the screen had a “unipersonal” design, made for a single set of eyes, two hands with fingers to type and one person who could release part of his or her archival and present memory inside the machine.